Desperate plot by prison officials to kill members of Indigenous people of Biafra (IPOB) held in captivity since 2015. 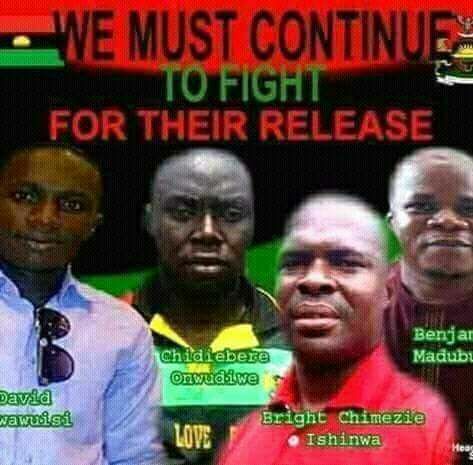 Our attention was this morning drawn to desperate strategies being put in place by some faceless prison official in Kuje prison at the command of the State to kill Benjamin Madubugwu, Bright Chimezie, and David Nwawuisi. A distress call received from Benjamin Madubugwu vide Welfare Department office of Kuje prison this morning, called for the immediate attention of the international community, United Nations, European Union and responsible international organizations. From the account given over the telephone, Benjamin Madubugwu narrated to us how he and other two IPOB members (Bright Chimezie and David Nwawuisi) has been singled out and consequently subjected to various forms of inhuman treatments and degradation. Apart from violent raid and teargassing of their cells by the agents of Federal Government, Benjamin Madubugwu was particularly beaten up, amidst severe injuries and bodily harms inflicted on him vide this unprovoked attack by lawless prison wardens led in aid by Arms Squad department, he has been transferred to a deadly cell where he now shares apartment with deadly members of Boko Haram convicts and other notorious violent criminals. Benjamin Madubugwu was in the recent past diagnosed of life-threatening ailments which require urgent advance medical attention overseas. Following the intervention of the court, an order was made allowing him access to his personal Doctor. Most shockingly, but very interesting to note that in a plot reasonably believed to have been orchestrated by agents of the State, his personal physician in the person of Dr. Ikechukwu Amadi who is administering improvise medical care on him was in a mysterious circumstance killed by persons believed to be working for the stare. Dr Amadi has since the 27th day of April 2018 committed to mother earth in his hometown at Udi in Enugu State while the real cause of his sudden but mysterious death is yet to be unraveled. It’s not unlikely that the state is seriously strategizing on their next possible target. Mr. Benjamin Madubugwu who is presently languishing in Kuje medium-security prison since 2015 for offenses he never committed has been refused bail severally on grounds and circumstances not sustainable under the extant laws, practice, and procedures. It is important to alert the world that Benjamin who had expressed fears of grand design by the paid scrupulous prison official to eliminate him at all cost and by any means, during his numerous appearance in court and during our private visit to him in Kuje prison may be counting his days on earth If no urgent step is taken by responsible international organizations, and community of nations to call Nigerian Government to order. It is on the strength of this ugly development that we are inviting the International community, Transparency International, President Trump and Israelite counterpart to immediately intervene. This is a country where Government has no respect for the sanctity of Rules of Law.